Today, we are releasing OpenIV 2.9.2. This version does not includes new features but contains important changes to provide support for the latest version of Grand Theft Auto V.
First time since 2015, we have updated OpenIV.ASI – our plugin, which provides mods support for Grand Theft Auto V. The latest version of GTA V has some non-critical changes in the code, which affected by OpenIV.ASI, and we made similar changes in our code. Without those changes in OpenIV.ASI, your game had crash during loading screen in some very specific scenario, only when you have Simplified Chinese language selected in game. Use ASI Manager to update OpenIV.ASI in your game folder. • We fixed an issue where sometimes OpenIV crashes while renaming folders inside archives. • We fixed an issue where import of texture image with 2×2 sizes was impossible due to infinite loading. • We fixed an issue where files was not shown in OpenIV after they was drag-and-dropped in game folder using Windows File Explorer. You can find change log on our bug-tracker here. We have an instruction how to translate OpenIV into your own language and we are calling for you to do so. You can find the localization guide here on GitHub. This version does not have differences from 2.9.1. Unfortunately, we were unable to answer those questions earlier due to real life (yeah we have some). First of all, we want to say “Thank you” to everyone who supported us in this tough situation. We’re very grateful for your support; for demonstration of the fact, that modding community is still a minority, but very vocal, creative and determined minority. You made the impossible and this story is already scribed into the history of PC gaming and the Internet itself. Yes, this is your victory! Congratulations and many thanks once again! The development of OpenIV will be continued as before. OpenIV never supported GTA Online modding and will not support it in the future. Our work will be continued within the Rockstar modding policy. Unfortunately, our highly anticipated mod “Liberty City in GTA V” will not be released because it clearly contradicts with Rockstar modding policy. Liberty City mod is a big loss for us, since it was a huge part of our motivation to push OpenIV functionality. If you are wondering what is next, well, we are currently revising our plans for the future. In the next several months, we are going to update all our core tools and mods, and then make first release of our Liberty City in V convertor. We do not have exact or even estimate dates, but for now we are plan to release first version of Liberty City during the spring season (March, April, May). That is all I have for you today. Today we are proud to release openCamera ASI Plugin for Grand Theft Auto V. Like the one for GTA IV this small plugin is doing one little thing – removes “Free Camera” boundaries in Rockstar Editor. With openCamera installed, you will be able to move the camera far away from the player position and make a video you want without limitation. openCamera requires ASI Loader. You can install it through “ASI Manager” in OpenIV or download here. openCamera does not increase recorded area in game, so, at really far distances from the player you may not see any action or it will be random action every time. openCamera must be installed during both editing and rendering otherwise camera position will be reset. If your game crashes while rendering process, make sure, you have a lot of free space on your hard drive and free memory. You want to have fast way to switch between original and modified files. 1 – Download and install OpenIV. Configure it to work with your copy of GTAV. 2 – Navigate to ASI Manager using menu “Tools” > “ASI Manager” or “ASI Manager” button on tool bar. Through ASI Manager, you can install, update or remove ASI Loader and OpenIV ASI plugins. 6 – Now you have to copy RPF archives into “mods” folder. For example, if you want to modify “Grand Theft Auto V\update\update.rpf” you need to copy it like “Grand Theft Auto V\mods\update\update.rpf”. 7 – From this point if you want to install mod or edit some file you need to do it in archive from “mods” folder. Now all your mods will be in separated folder, and original files will stay not modified. If you want to switch back to original files just go to ASI Manager and remove OpenIV.ASI. In addition, you can remove ASI Loader to disable all ASI plugins that you have installed. You can use ASI Manager any time to switch between mods and original game. You no need to remove “mods” folder every time. Today we are proud to announce a new release of OpenIV is available for download. OpenIV 2.6.3 contains several new features and improvements. New tool named “ASI Manager” allows you to easily install or uninstall ASI loader and our plugins for GTAV. 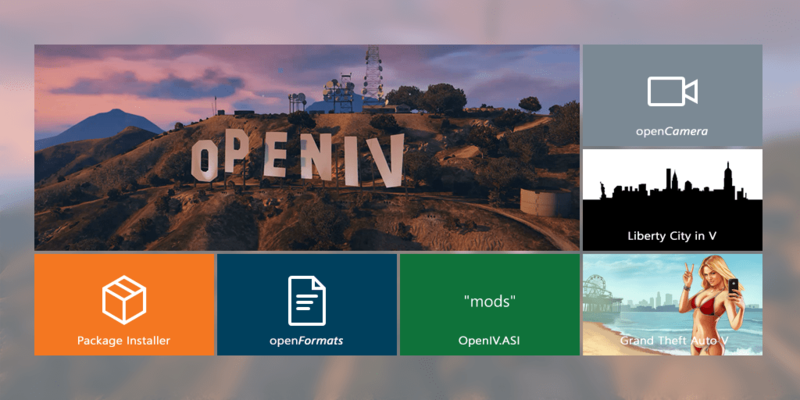 New version of OpenIV.ASI gives you ability to keep original GTAV files safe and put mods into special “mods” folder. Just put archive (for example, x64a.rpf) you want to mod into “mods” folder and made changes in that copy. OpenIV.ASI will force game load your archives form “mods” folder. In addition, if you want to switch back to original files just remove OpenIV.ASI and ASI Loader using ASI Manager. Powerful OpenIV texture editor now have support for GTA V .ytd texture files. You are free to edit any .ytd files using all features we have. Finally, OpenIV fragment models viewer got support of GTA V .yft files. This will allows you to view GTAV vehicles models. We also have fixed some critical issues in our code. Now you have less chance to corrupt your files. As always, the full change log is available here.